We took advantage of a beautiful day on Monday to cut down our mushroom trees. 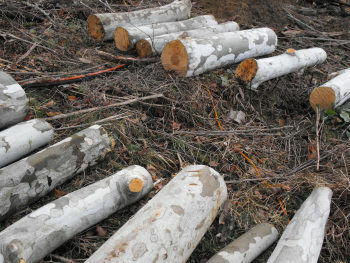 Logs for mushrooms should be cut from healthy living trees so that your spawn doesn't have any wild fungi to compete with, and February is the perfect time of year to cut the fully dormant trees. 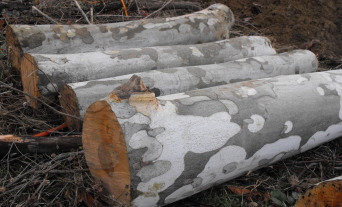 The type of tree to cut for your mushroom depends on the species you want to grow. Shiitakes can be grown on oaks, Sugar Maple, Ironwood, Sweetgum, and a few other species --- most people prefer to grow them on oaks. However, we don't have many oaks in our forest since they're a prime timber tree, so I was glad to learn that a study in North Carolina suggested that Sycamore is an even better host for shiitakes in our area. If you cut your trees earlier in the winter, you should leave them whole until near the time for innoculation. But since we will be innoculating soon, we went ahead and cut our trees up into logs --- about 3 to 8" inches in diameter by 36 to 40 inches long. I've found that shorter and thinner logs are a bit easier to manhandle into and out of the kiddy pool we soak them in. Stay tuned for innoculation!